The U.S. Army’s Frankford Arsenal, Philadelphia, Pennsylvania, was officially opened on May 17, 1816 and closed 161 years later on September 30, 1977. 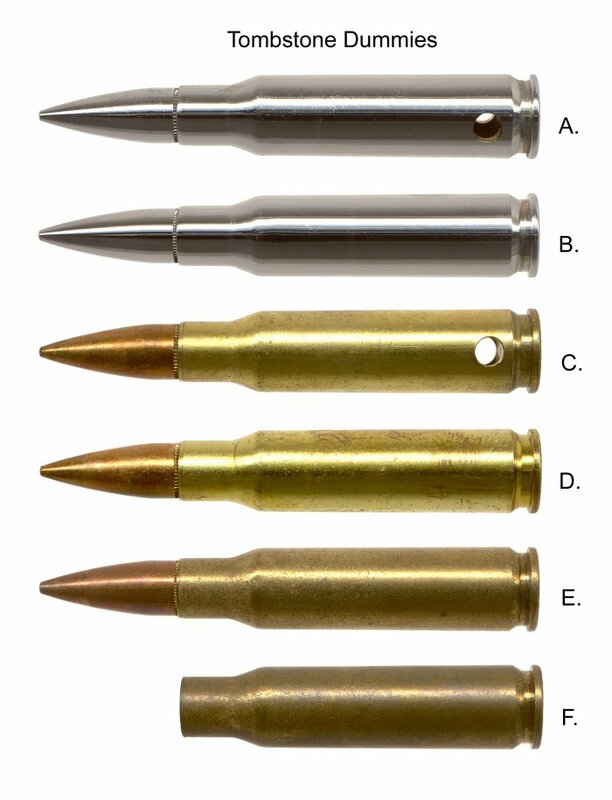 To commemorate the Arsenal’s many years of service to the nation, the Commanding Officer, COL Frank Hackley, decided that the final cartridge to be made at the Arsenal would be a dummy 7.62x51 M80 ball round. The precedent had been set 21 years earlier when the Arsenal made a commemorative .30-06 round in 1956 to celebrate the .30-06’s 50th birthday. The NATO dummy used a case with no flash hole, a number 46 primer cup, and a standard M80 Gilding Metal Clad Steel (GMCS) ball bullet. The dummy was to be chrome plated and have a special headstamp that included the code for Frankford Arsenal (FA), the NATO symbol (+), the year the Arsenal opened (1816), and the year it closed (1977). During manufacture of the first 500 cases, it was noted that the headstamp characters were too light and shallow in the case head and would probably fill in somewhat during plating and be hard to read. These cases were set aside, a new headstamp bunter with stronger characters was made, and production of 3,000 cases resumed. The figure above shows three headstamps. A is the standard configuration, chrome plated. B is the same headstamp impression, but on an unplated case. C is a light impression made with the first bunter. Originally, the cartridges were named “Commemorative,” but were generally called “Tombstone” because the years of the Arsenal’s birth and death were in the headstamp. Arsenal employees also called them “Commendable” because they approved of the project, and “Silver Bullets” because of their appearance. The initial plans were for each departing employee to receive a chrome-plated dummy with two holes drilled in the cases after the rounds were chrome plated. However, the departure of employees turned out to be faster than the manufacture of the dummies, and as time-saving measures under the circumstances, some manufacturing steps were omitted, as shown in Figure 3., so each employee would receive a round as they left. A is a standard chrome-plated round with two case holes. B is a chrome-plated round without the case holes. C is an unplated round with the case holes. The frosty appearance of the cases was because they were removed from the production line after being in a caustic solution and rinse prior to plating. D is an unplated round without the case holes. E is an unplated, but cleaned, round made from the light headstamp cases saved earlier. At the end, a few more dummies were needed and the production line had been shut down. So 100 of the earlier cases with the light headstamps were used to assemble the final rounds. F is one of the 400 remaining unprimed empties with the light headstamps that escaped being scrapped. References: IAA Journal number 267-268 has an article about the “Tombstone” that has much more information about this commendable round that was Frankford Arsenal’s last.